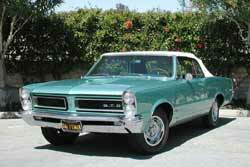 The Pontiac LeMans was restyled for 1965, as was the GTO. The most noticeable difference was the new front end, featuring twin vertical headlights. Output for both engine options was increased via revised camshafts and intake manifolds. Four transmissions were available in 1965. Shiftless customers could buy a two speed automatic with either steering column or console mounting. Three Hurst equipped floor mounted manual transmissions were available; a three speed, and close or wide ration four speeds. A variety of rear axle ratios were available, ranging from a fuel thrifty 3.08:1 to a performance 4.33:1. Aluminum front drum brakes became available, which dealt with the heat problem. A heavy duty radiator, power brakes, metallic brake linings and limited slip differentials were also on the options list. Click Here to View the WebCars! '65 Pontiac GTO Photo Collection. Single Carter four barrel carburetor. 0 to 60 mph . . . . 7.2 sec. 0 to 60 mph . . . . 5.8 sec. 0 to 100 mph . . . . 14.9 sec.